Plenty of good input and excellent questions have resulted from BB’s first look at a Top Ten list of Burque cycling infrastructure gaps, an exercise based on the fact the City will shortly have roughly one fed/local match million dollars to spend toward addressing at least one such gap. In addition to the great ideas, it has also been wisely pointed out that a million dollars just doesn’t go as far as it used to. For instance, demolishing the Big-I and starting over from scratch with some semblance of concern for cyclists (and walkers) would cost far more than a million dollars. Pity. It is such a good idea. The project has to be within the city limits of Albuquerque. Here’s an online map to help those interested in figuring out City v. County, etc. For now, we’ll disregard the typical hang-ups that make fixing anything concerning cycling infrastructure damn hard, (e.g., right-of-way, whether the work is in Brad Winter’s Council district, etc.). 6: A bridge over North Diversion Channel Connecting Claremont NE to the NDC Trail: As mentioned last time, BB has previously mentioned quite a few stored pipedreams projects definitely worth spending a million bucks upon. You can read more specifics on Project #6 here. In short, extending/finishing the eastern terminus of Claremont NE, a lovely and important east/west bike route in the Northeast Heights, by connecting it directly to the 2nd most traveled multi-use path in town would be a marvelous thing. The bridge alongside I-40 over the Rio Grande named in honor of cycling advocate Gail Ryba might be the single-greatest piece of bike infrastructure in town (by the way to give some sense of cost in context, the Ryba Bridge and adjacent paving, was $6.9 million back in 2010). Yes, the bridge is too bumpy and the highway noise is too much, but its view of the River and the connection between Bosque Path and West Side are glorious things. Until you get to the West Side. Soon you go from glorious, if bumpy Gail Ryba, to a much-maligned sidewalk along a frontage road/Walmart combo that spills into a hugely dangerous crossing under Coors at Ouray. You can read about the situation and accompanying problems here. No, a million dollars is not gonna get us a complete fix of this problem. The sins of our roadway project fathers, namely those who oversaw the Coors/I-40 Reconstruction in the mid-2000s (remember GRIP?) are too great for a measly million dollars to wash away. By the way, the Walmart adjacent to this infamous sidewalk is doing some curb/landscaping work that might well reduce the gravel that tends to creep onto said infamous sidewalk. One kinda wishes we could get those roadway project fathers to personally dig a tunnel, for free, underneath Coors connecting Gail Ryba to the I-40. Perhaps they could wear orange jumpsuits. Shackles and pick-axes would also be nice. We could offer them hard-boiled eggs, all they can eat, for dinner. Okay, maybe we’re wasting our time considering projects that would cost far more than one million dollars and involve lengthy and expensive trials of former government officials. Here’s a simple, yet seemingly radical, idea that would transform riding a bicycle in Albuquerque: Put up signs telling us how to get places. We could probably plop hundreds, if not thousands, of signs like “Bosque Tr,” bike symbol included, all over town. We’re talking Manual on Uniform Traffic Control Devices (MUTCD) compliant, people! Woman from Couple: Where the hell are we? Woman: Chicago. We rented these bikes and love this trail. Where does it go? Me: Well, in about two miles you’ll go under a busy road. The trail goes on for another five miles after that, circling back to the busy road. Woman: (Slightly scowling) Busy road, huh? Me: Yeah, But you go under it. Woman: I don’t know what we should do. Me: Well, I have to get going. How ya like those PACE bikes? Man: Where the hell are we? Any frequent cyclists in town can report similar interactions. Nobody knows where the hell they are going. Let’s buy/install a bunch of signs. Ideally, signage would be bought/installed with new/visiting cyclists in mind, relating information on both important landmarks and safe routes to get there. Along the way we could also spend a few bucks taking out bike route signs (and such designation) on busy roads like 2nd Street across/near I-40. One shudders to think of newbie/tourist riders naively tackling 2nd at I-40 for the first time because the signs say it’s a bike route. One shudders to think of anybody riding a bike on 2nd at I-40. So let’s direct riders to the good routes and the great places they can use those routes to get to. 9: Close Coal Avenue from 3rd Street to I-25 and turn it into a cycling/walking-only plaza. This one will need a bit of explanation, otherwise BB’s sanity would be questioned. And we are perfectly sane. Sane, we tell you! SANE!!! As readers may know/recall, the City is currently in the process of finalizing a proposal to improve the Silver Bike boulevard from Yale SE west to the Rio Grande River, after the usual public meeting/comment period. In fact, that proposal is scheduled to be announced/discussed at the December meeting of the Greater Albuquerque Bicycling Advisory Committee (and hopefully other venues that attract larger audiences). Long public meeting/comment period short, the problem in getting cyclists from ages 8-80 of all ability and comfort levels from Yale and Silver to the Rio Grande River is crossing I-25 and the train tracks. Yes, there are other considerations (e.g., Broadway), but these are the big two. Many ideas have been thrown (even “bandied”) about on how to make these two conflict points safer. BB now suggests the solution is through their entire elimination as car/cyclist/walker conflict points by taking the car out of the equation. Moving west to east, close Coal at 3rd, put the appropriate mix of barriers, planters, picnic tables and Adirondack chairs all over Coal all the way up the hill through the I-25 interchange, preferably to Cedar, so that Silver Bike Boulevard cyclists can access the new Coal Pedestrian Plaza more safely. No, Better Burque is not insane. Really. Let’s preface this defense of the apparent insanity above by admitting that on a fundamental level, there’s an essential, important, and defensible “screw you” to drivers in this reconfiguration. Burque is a deeply car-centric town. Drivers get whatever they want, even if they don’t always see that. Want a $93 million Paseo del Norte flyover of I-25, one that screws anybody wanting to safely cross on a bike or walking? Got it. Want to live further away from where you work and have government roads and services brought to you? Got it. Want traffic signals set for your driving convenience over those walking our streets? Definitely got it. Want free and ridiculously inexpensive parking everywhere, all the time? Got it. Want government to avoid spending any dollars on sidewalk and other pedestrian improvements, even if it eventually means spending just as much if not more dollars in ADA violation fines and personal injury lawsuits? Got it. So with a bit of a nice, comfortable chip on the shoulder, let’s close this ************. First, let’s look at the average daily weekday traffic counts for both Lead and Coal in this stretch. For Lead we get roughly 11,500. For Coal, 8,500. For comparison, Zuni SE, site of a recent “road dieting” down to one lane in each direction, averaged almost 22,000 in the same period (2015-2016). Close Coal Avenue from 3rd to Cedar. Make the middle lane on Lead reversible, thus creating two westbound lanes in the morning and two eastbound lanes in the afternoon. Adjust reversibility as needed, in case BB is miscalculating west/eastbound usage patterns. Place a signalized crossing at Lead and Edith. This idea, or to put the signal at Walter, is already on the table. Traffic “calm” Cedar at Presbyterian via a four-way stop (instead of the stupid current two-way stop that disfavors bike boulevard users) and extend bike boulevard signage south to Coal. 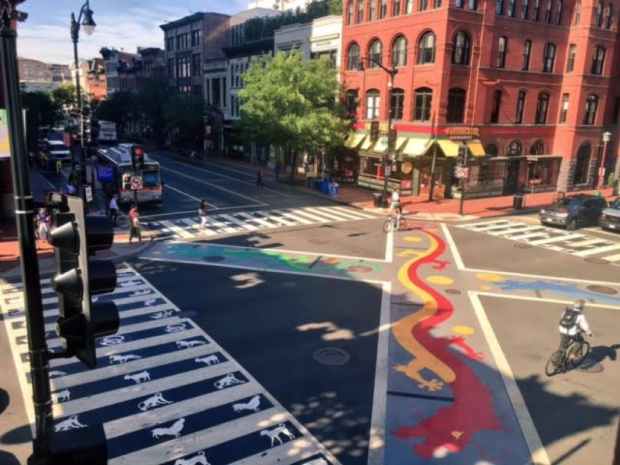 Keep Broadway open through Coal (as there’s no other realistic solution) and install something like “Barnes Dance” crossing striping like this: I’m thinking Barelas-themed art-work ala the Washington D.C. “Chinatown” crossing above. A similar treatment at Coal and 3rd, as Pedestrian Plaza users mix again with drivers and downtown/Barelas. Hmm…we need a name for this Plaza/Corridor. I suggest “John Lewis Walkway,” as he lived just a bit south of Coal nearby, but we can figure that out later. Chances are, the idea above will not be included in the soon-to-be-announced proposal to improve Silver Bike Boulevard from Yale to the River. Likewise, chances are very good that implementing the proposal will not make walking/cycling across I-25 and over the train tracks nearly as safe as closing Coal Avenue would. Closing Coal would not only greatly help cyclists and walkers safely cross, for the first time in decades, from east of I-25 (built around 1960) to downtown. We’re talking connecting UNM/Nob Hill to Downtown in a profoundly multi-modal way. It would also help reconnect a east downtown neighborhood bifurcated not only by I-25, but by drivers desperate to get there. Better Burque has gone on long enough about this. What cycling gap/improvement would be the best use of a million bucks? Is it one of the nine posited here or in a previous post? Is it something BB has never mentioned? I’m hoping for the latter. Send those ideas in and they will most certainly be passed along to those spending the million bucks. Promise. Happily so. What ya got in mind? I like the coal idea. The neighbors are bitching about the drag strip outside their front doors. But when you design a dragstrip, you get drag racers. If you build it they will come. I would actually just make the 3rd lane a turn/suicide lane. This city couldn’t pull off a functioning reversible lane if Robert Moses descended from on high and parted the the blood red sea of traffic himself. You know, Biliruben, writing likes like “Robert Moses…” just reminds me to tell you: You need to write a blog post or two, or 1,000. Next Post C’mon Cyclists: Share the Coors Boulevard!